Having returned from a night’s stay at the Westin Whistler where I was upgraded to a Junior Loft Suite when I am just a lowly Gold member, I have to say being an SPG member is still somewhat rewarding and it is one of the factor that keeps me looking to stay in their properties whenever possible. I do think I have stayed nearly all their brands of hotels before, with the exception of element Hotels. The latter is just because it is not really easy to find an element-branded property since they are so limited in numbers. And today, SPG just announced a new brand under the Tribute Portfolio. Starwood actually has a total of 9 brands already with the St Regis and Luxury Collection at the high-end of the spectrum, Westin and W at the upper-end, Sheraton and Le Meridien being the mid-range, while Four Points, aloft and element brands takes care of the budget accommodation options. The Tribute Portfolio will be in the same slot as the Westin and the W, though the hotels are more like a budget version of the ‘Luxury Collection’ since each property has a unique name. SPG probably created this new brand as other competitors like Hilton and Marriott have created new ones to expand faster. It is probably meant to counter the ‘Autograph Collection’ hotels by Marriott and the ‘Curio’ hotels by Hilton. Large hotel chains are creating upscale, contemporary brands that feels like a boutique hotels since many small independent hoteliers have gained prominence lately and chipping away at the dominance held by the traditional hotel chains. Who can blame customers that want a nice place to stay in rather than the drab-looking Sheratons? 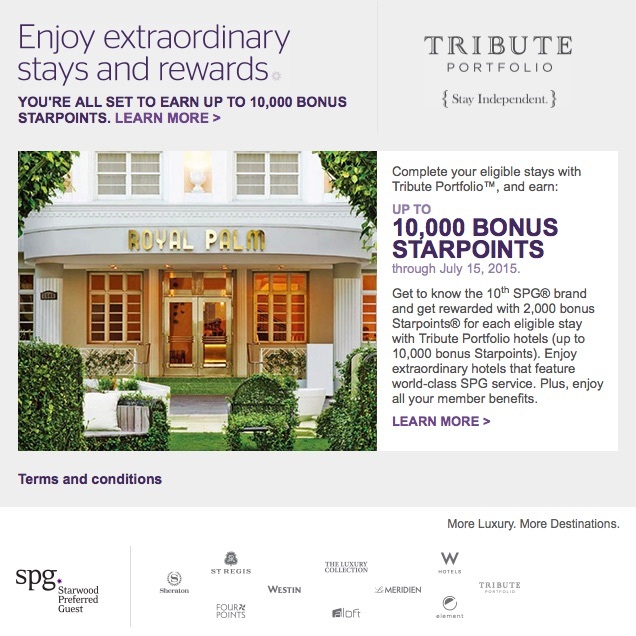 To entice current SPG members to stay at the hotel, they will be rewarded with an additional 2,000 SPG points per stay with Tribute Portfolio Hotels, up to 10,000 points for stays from now until the 15th of July. The ‘s’ in the hotel seems to be a bit of a misnomer really since currently they have only gotten one property so far which is the Royal Palm at South Beach, Miami. Again only one property here, but the Royal Palm at South Beach actually has a much nicer location than the other SPG property which is the W at South Beach. The art-deco themed hotel is located closer to Ocean Drive and all the iconic landmarks in the area so it is a great addition to the SPG portfolio. It is also interesting to note that SPG also has the upper tier St Regis located in Bal Harbour, which is just north of South Beach. More properties are due to open in locations like Asheville, NC, Nashville, TN, Charleston, SC and Savannah, GA. It is somewhat disappointing that they are opening in second-tier cities rather than prime locations where their coverage might be lacking. I would be interested in a Tribute property in London and Berlin but not sure of the other 4 cities. Maybe the W Hotels was just getting tired and the change in leadership probably also meant SPG had to do something new. A new brand in this category is actually fitting since I would probably stay at something like this compared to the W. Though they need to really open up more of these properties at locations where I would want to go to.